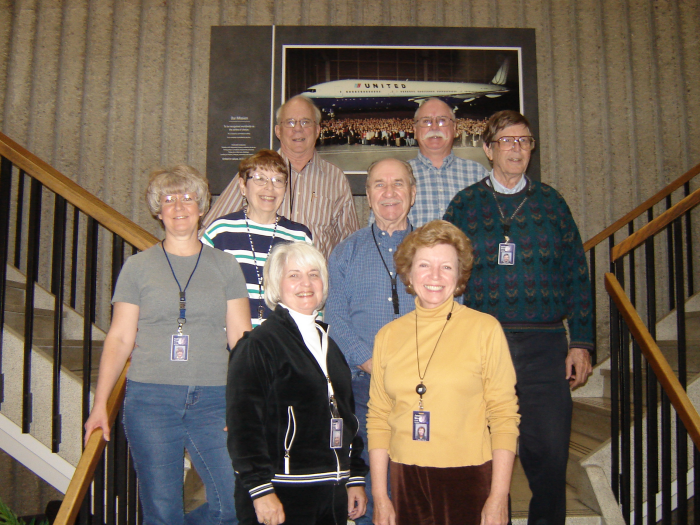 The United Airlines Historical Foundation collection of historic documents, photos and memorabilia is on display at United's Flight Center in Denver, Colorado. A few of the many items are portrayed here. As the dedicated volunteers of UAHF (pictured below) complete new displays, we will share them with you. The plaque on the right side reads: Bellefonte, Pa. was a fuel stop on Hell's Stretch, the treacherous corridor over the Allegheny Mountains which many an old-time pilot crossed during the early days of the U. S. Air Mail Service. Here, just south of the gap in the Bald Eagle range, an unknown pilot made a rough landing sometime in the 20s. This broken propeller is mute evidence of the many hazards that confronted the rugged airmen when aviation was a struggling industry. The plaque on the left side reads: This propeller from a De Havilland 4 mail plane is presented to the pilots of United Air lines as a tribute to two durable friends from the early days of commercial aviation. According to Bill Arnott, Doctor Hoffman was on the crash committee and obtained the prop when the wreckage site was being cleared. After having it for several years he passed it along to Capt Slim Larned who was United's Regional Director of Flight Operations in Los Angeles where Arnott was based. Slim and Arnott became friends and when Arnott became involved in his activity at DENTK Larned donated the prop to him for the museum. Capt. Bill Williams was the Regional Director of Flight Ops at SFO at the time. 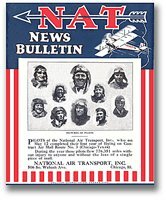 Pilots of the National Air Transport, Inc, who on May 12 completed their first year of flying on Contract Air Mail route No. 3 (Chicago-Texas). During the year these pilots flew 776,351 miles without injury to anyone and without the loss of a single piece of mail. Note: The first year of flying on CAM 3 route, Chicago-Dallas, was started in 1926. Thus, the completion of the first year of flying referred to was May 12, 1927. Stewardess blue uniform is circa 1945-1951. 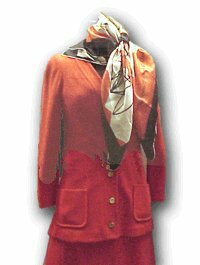 It was worn on the initial San Francisco-Honolulu DC-6 flights in 1947 by stewardess Marge Tolosano. 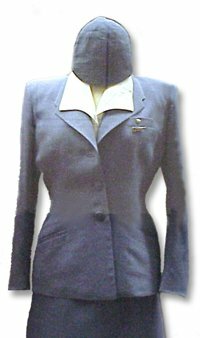 This Flight Attendant uniform was worn from 1970 to 1973. It was designed by the famed Hollywood designer Jean-Louis, about the same time the Douglas DC-10 was introduced. 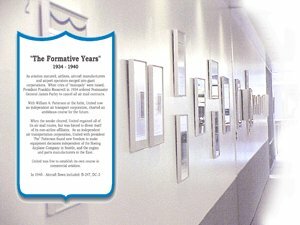 Each hallway display at the Flight Center has a plaque that describes significant events in timeline fashion. The Swallow rendering commemorates the 50th anniversary of United Airlines and is signed by Captain Leon D. Cuddeback. Cuddeback piloted the first air mail flight in the Pacific Northwest U.S. on April 6, 1926 and attended a reenactment of that flight in 1976. For this event, United Captain “Buck” Hilbert flew the original route in his restored Swallow bi-plane. The plane carried 10 sacks of mail over the same route that Cuddeback flew from Pasco, Washington to Elko, Nevada via Boise, Idaho. At the ceremony that followed the flight, a new Boeing 727 airplane was christened “Leon D. Cuddeback” in recognition of this historic event. Stewardess & Flight Attendant wings.